Donavan Harris is the owner of Armor Inc. Diesel & Suspension in Red Deer, Alberta, Canada. 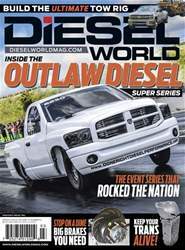 He teamed with Lenny Reed of Dynomite Diesel Products to build a drag truck capable of hitting the dyno on a regular basis, as well as tackling the pull sled when needed at competitions like the Ultimate Callout Challenge. After the initial build they competed in the inaugural UCC, finishing in the mid to upper range in each event for a Fourth Place overall finish. They came back strong in 2017, finishing in the Top Three in the drag race and sled pull for a second Fourth Place finish. Harris has also won the Edmonton NHRDA Pro Street, as well as the Alligator Diesel dyno day and the Beans Diesel Performance dyno event. Follow along for an unprecedented inside look at this amazing truck. Donavan Harris raced the Armor Inc. Dodge to a Third Place finish in Indianapolis at the 2017 Ultimate Callout Challenge. His best quarter-mile pass in the 5,700-pound truck is 8.56 seconds at 167 mph—so far. 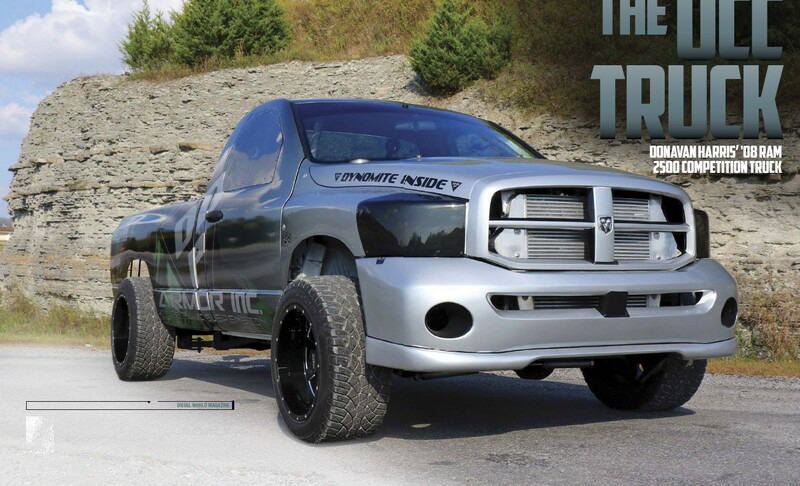 Starting with a regular cab, longbed ‘08 Dodge 2500, Harris and his team stripped the truck down before building it back up with reduced weight and a fully fabricated, race-worthy suspension. Up front, they removed the factory coil spring and shock mounts from the frame and axle then replaced them with new fabricated mounts to integrate a pair of Viking double-adjustable coilover shocks on each side to dial in the suspension to match the track conditions and competition requirements. To locate the axle and keep it locked within its travel, they replaced the weak factory control arms with lightweight fabricated chromoly control arms. Dual steering stabilizers help keep the truck pointed in the right direction at speed. To reduce weight, the front fenders, hood, and bumper supports were removed and replaced with a one-piece fiberglass front end and a bumper shell. The hood and bumper are braced to keep them from deforming at high speeds as Harris rockets down the track.